Pewter Ornament 2.2" x 3.25". Comes in a sealed bag. Laser Engraved Wood Magnet. Made in the USA. This shoulder patch is great for collectors or as a stand alone. 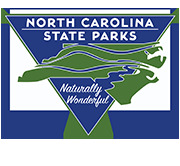 3.5" x 2.25 " Patterned after the shoulder patch worn by our state park rangers. Metal embossed license plate, individually wrapped with holes for mounting. 6" x 12".